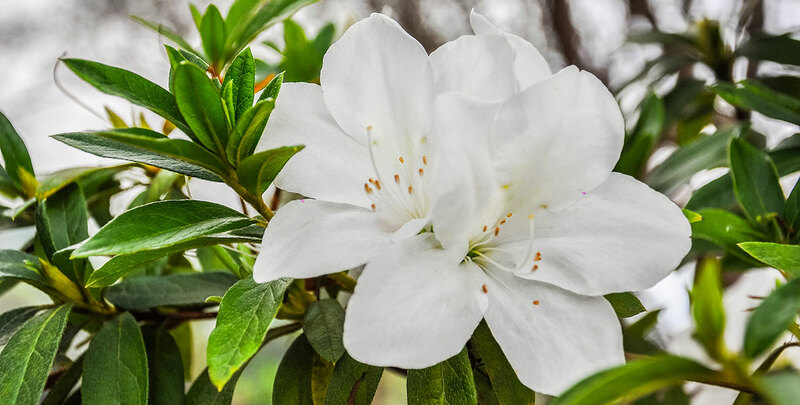 Rhododendron ‘Gomer Waterer’ is relatively modest for a rhododendron hybrid and features blooms with rather subtle shades of creamy white and yellow in addition to soft mauve pink on the edges. These funnel-shaped flowers with a touch of pink are borne in generous clusters and make a great display in late May-early June. The delicate but abundant flowers are supported by thick, leathery, deep green leaves that provide an excellent backdrop and make the subtle flowers stand out even more. The profuse blooms are preceded by pink or, more specifically, rose-lilac flower buds that offer a wonderful sneak preview of the flowers that will emerge from them. Rhododendron ‘Gomer Waterer’ is somewhat smaller than other rhododendrons, which makes this hybrid great for small gardens, narrow borders or a position along a path, while its dense and compact growth habit make it useful as a screening hedge. In addition to remaining small, ‘Gomer Waterer’ has a slow growth habit (10cm a year), but it will reward you with its rather exceptional tolerance of sun and heat, although it prefers a position in partial or dappled shade like other evergreen rhododendron cultivars. The soil needs to be well-drained, acidic and rich in organic matter. Where this is not the case, adding some ericaceous compost can be a convenient and effective solution. Deadheading the flowers after they fade is very beneficial for future growth and flowering. No pruning is required to keep it in check, which makes it very low maintenance. Keep well watered to prevent the soil from drying out.